When it came to architecture of the 1960s and 70s, concrete ruled supreme. During this period, countless tower blocks sprouted up all over the UK in a rushed and misguided attempt to provide homes for families who were much more accustomed to being closer to terra firma. The towers and the estates upon which they squatted quickly proved to be ineffectual, disintegrating communities and providing fertile grounds for crime and other social complications. In recent years, many of these tributes to alienation and botched planning have been thankfully demolished. However, one of the most famous examples from that era- London’s Trellick Tower– is still standing, stronger than ever… and, unlike many of its destroyed concrete cousins, it is now a celebrated piece of late 20th century architecture. With its distinctive design, the 31 storey tower, which stands on Kensal Town’s Golborne Road, a short distance from the famous Portobello Road market, has become a modern London icon, visible from many parts of the city. The Trellick Tower is so embedded in London’s fabric that it even featured in the promotional handover video which was played at the closing ceremony of the 2008 Beijing Olympics. The architect behind the Trellick Tower was a chap called Erno Goldfinger… and yes, there is indeed a connection with James Bond which we shall discover shortly! Born in Budapest, Hungary in 1902, Erno Goldfinger was quite a character. He moved to London in 1934 after marrying Ursula Blackwell (heiress to the Crosse and Blackwell condiments company) and by all accounts was a gruff, egotistical, arrogant man with a fierce temper and zero humour- during his career, he fired a number of assistants for simply sharing a joke in his presence! Having said that, others who came into contact with the architect stated that, at times, he could be most charming. His first work in London was a set of apartments which came to fruition in 1939 at numbers 1-3, Willow Road, Hampstead. Goldfinger himself lived and died here. For its time, this design was ultra-modern and certainly didn’t fit in with the more traditional appearance of the other housing stock cluttered around the heath. Many Hampstead residents found this striking design an unwelcome intrusion… one of these local critics was Ian Fleming, creator of Britain’s most dashing superspy, James Bond. Ian Fleming… Erno Goldfinger’s arch nemesis! It is said that Fleming despised Erno Goldfinger’s architecture and personality so much, he decided to borrow the distinctive surname and apply it to one of his most notorious villains- ‘Auric Goldfinger’! When the novel was released in 1959, Erno Goldfinger was furious. As well as the name, the fictitious baddie shared an uncannily similar family background to the architect; both being East European Jews who’d emigrated from their homelands in the 1930s. Also of course, there was the fact that the pair were both domineering control-freaks who would let nothing stand in the way of their visionary work! Erno and Auric… the two Goldfingers together… can you spot the difference?! At his office, Erno Goldfinger dished out copies of Fleming’s novel, demanding an opinion on the text. It’s safe to assume that this individual was quick to receive his P45! Erno Goldfinger decided to get his lawyers involved and the matter was quickly tided up- all the publishers had to do was pay the relevant costs and declare that all characters in the novel were fictitious. Today, Goldfinger’s Willow Road dwelling is owned by the National Trust and is open to the public. (Please click here for more information). From the late 1950s onwards, looming tower blocks began to mushroom across London as council planners decided to put all of their housing eggs into one big concrete basket. At first, these sprawling estates were embraced by many- in their early, unspoilt state, the high-rises were considered clean and modern; ‘streets in the sky’ with their apartments boasting ample space, impressive kitchens and indoor toilets- a truly rare luxury for many working class Londoners. Erno Goldfinger was a staunch supporter of the tower-block craze and his first design in the emerging style was 1963’s Balfron Tower which still stands in the east end, overlooking the Blackwall Tunnel Northern Approach. The Balfron would prove to be the forerunner to the Trellick Tower. As part of a publicity stunt, Erno spent several weeks living in one of the Balfron’s flats with his wife, during which time he identified problems that required ironing out and could be avoided in future projects. With his post-war work, Erno was influenced by a fellow architect; the Swiss-born and adopted Frenchman, Le Corbusier. In London, two of the best examples of Brutalism are very famous buildings indeed- The Barbican complex and The National Theatre. Europe’s earliest tower-blocks, built under the influence of Le Corbusier, appeared in sunnier climes; mainly around the Mediterranean in cities such as Marseilles. In this environment, the stark concrete looked rather appealing, especially when situated close to sparkling, blue seas, their facades painted in pastel colours to reflect the sun. Erno Goldfinger’s Trellick Tower was commissioned by the Greater London Council in 1966 and was one of the last of the towering monoliths to be given the go ahead. In 1968, whilst the Trellick was still under construction, the effectiveness of the tower block building spree was brought into question when Ronan Point; a 22-storey block in Newham, suffered a gas explosion, causing floors to collapse and four people to die. Erno Goldfinger however didn’t let this event bother him, confident that his own unique design was safe and sturdy. By the time the Trellick Tower opened in 1972, such council blocks had gained a notorious reputation for being harsh, alienating environments prone to crime and squalor; a reputation which would only worsen throughout the late 1970s and 1980s. The Trellick was plunged into chaotic, hellish conditions from the start. During the Trellick’s very first Christmas, residents were left without heat, water or electricity as a group of vandals decided to smash a fire hydrant as part of their festive fun. Thousands of gallons of water were sent gushing down, flooding the lifts and corridors and blowing fuses. Over the following years, the rota of misery grew and grew. One pensioner, forced to climb the stairs after finding the lifts to be broken yet again, collapsed in a stairwell and died. Drug abusers lurked and muggings became rampant. There were several terrifying reports of attacks on children and women being raped. One young mother, suffering from depression and unable to take life in the council block any longer, threw herself off of one of the Trellick’s wind-swept balconies. In the midst of these depressing social problems, something bold, creative and cheerful managed to emerge when a local resident- Leroy Anderson Lepke, along with his sister who went by the name of ‘Ranking Miss P’, went about establishing a hip, pirate radio station to cater for the area…. the antenna of which was secreted right on top of the Trellick’s soaring rooftop. Originally called ‘Rebel Radio’ and first going on air in 1981, this station quickly became known as the ‘DBC’. A play on BBC, these adapted initials stood for ‘Dread Broadcasting Corporation’. The DBC specialised in playing reggae, dub and soca records; music which was popular amongst the local West Indian community, but was not sufficiently represented on any national radio station at the time. Picked up on crackling sets all over North-West London and beyond, the DBC quickly became extremely popular- its organisers even running a successful side line in t-shirts boasting the DBC logo; an essential fashion accessory at the time! At its height, it is estimated that up to 100,000 people were tuning into the cool rhythms being beamed from the Trellick’s rooftop. As the DBC’s popularity increased, so too did the arrests… the unlicensed station was busted on numerous occasions and was finally forced to disappear in 1984- although they did manage to go out with a bang, pulling off a live broadcast at that year’s Notting Hill Carnival. A more detailed account of the DBC can be found here. The site also features a number of authentic recordings which were taped whilst the station was on air. Today, an antenna for sending out broadcasts in still in place on top of the Trellick- although this one’s slightly more legit in that it’s owned not by the DBC but the BBC! In the trade, this transmitter station is officially known as ‘Kensal Town’. The BBC’s ‘Kensal Town’ transmitter… continuing the Trellick’s tradition of broadcasting to the masses! Despite its distressing past, the Trellick Tower today is one of London’s most sought after properties. The change occurred gradually, the main impetus being the introduction of ‘right to buy’ and the formation of a resident’s association in 1984. The association fought hard to improve the Trellick, their main concern being security. An intercom system was introduced along with a concierge. In later years, extensive modernisation was carried out within the building’s interior, making it smart, clean and worthy of habitation. There is a famous incident in which Ms Lee Boland- chairwoman of the Trellick’s residents association- met Erno Goldfinger (who evidently liked to keep an eye on his works) in one of the tower block’s lifts. Erno, in his typically bluff manner, replied by saying, “Bloody women… never satisfied”! By the late 1990s, the Trellick had cleaned up its act considerably and was now a place where many people actually wanted to live, the prices of the apartments rising stratospherically. A while ago, I was flagged down one evening by a young couple on their way to a swanky party at the Trellick… and they admitted that they were just as interested in seeing the architecture of their friend’s flat as they were about the drink and socialising! Today, the distinctive tower block’s role in recent social history has been acknowledged by the authorities and has consequently been awarded grade II listed status. Sadly, the Trellick’s grouchy creator, Erno Goldfinger passed away in 1987 and never got to witness the love which eventually flourished for his masterpiece. In a way, it’s probably just as well, as the boasting and inevitable calls of ‘I told you so’ from the loveable old grump would have surely been insufferable! Because of its unique and strangely appealing aesthetics, the Trellick Tower has appeared in many films, TV series and music videos. This pioneering film tells the story of Pat, a young, working-glass girl who wants to settle down in life but is increasingly frustrated in her relationship with boyfriend, Del. After Del takes things too far, Pat realises that the time has come for her to stick up for herself and defend her rights. 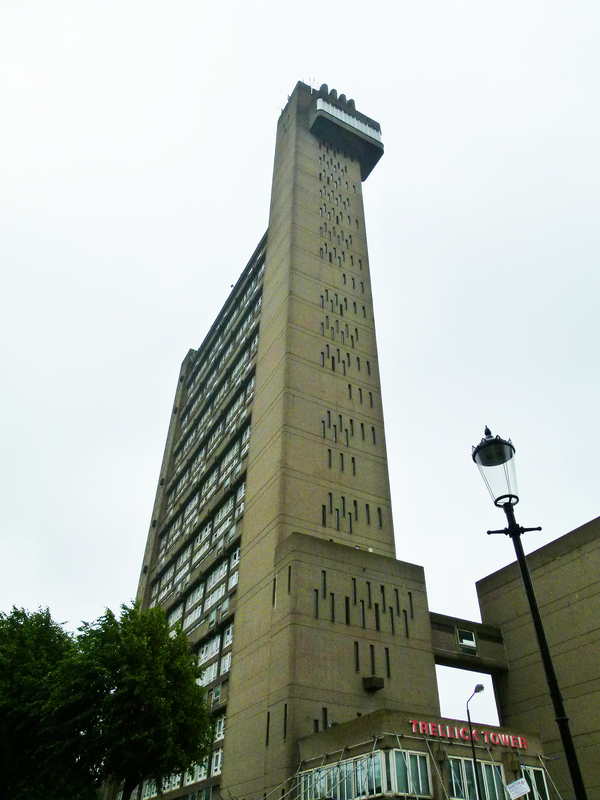 In the film, the heroine is proud to own her own flat… which is situated in the lofty heights of the Trellick Tower. In this spin-off from Grange Hill, the mischievous rogue, Tucker Jenkins finds himself recently out of school, struggling with the dole and high unemployment in 1980s Britain. Episodes were filmed all around North-West London; Paddington, Harlesden, Acton, Shepherd’s Bush, Acton and Harrow. 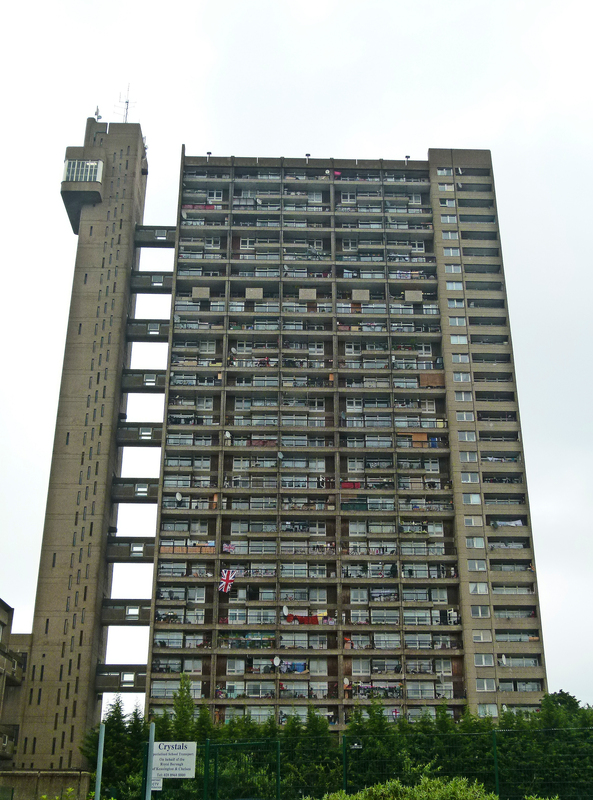 In the series, Tucker’s friend, Tommy Watson lives in the Trellick Tower as can be seen in the following clip (which also gives an idea of the impressive views over the city afforded by the Trellick’s sky-high corridors). Starring Sadie Frost and Jude Law (in his first major role), Shopping followed a mob of teenagers who whiled away their hours joyriding and ram-raiding. 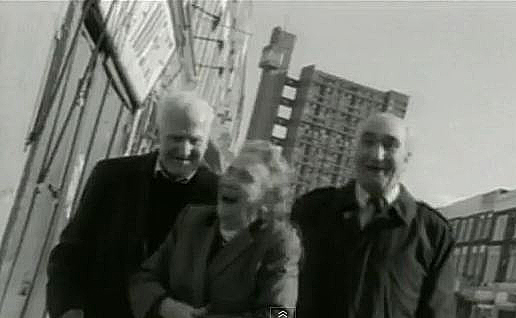 Requiring a bleak council estate as a backdrop, the film’s makers naturally turned to the Trellick Tower. Incredible Games was a BBC children’s quiz show in which teams carried out a series of challenges housed inside a futuristic skyscraper; the aim of the game being to ascend as many floors as possible. The exterior of this dystopian arena was portrayed in the opening credits… and, as I’m sure you’ve already guessed, the building was in fact the good old Trellick Tower! I wonder what Erno Goldfinger would have thought of his cherished icon being used for such frivolous purposes! The games were controlled by a ‘Max Headroom’ type character who controlled the proceedings via a video screen in the tower’s lift. This somewhat disturbing looking individual was played by David Walliams who of course later went on to find fame with Little Britain. David Walliams in an early role, playing a character whose home was inside the Trellick Tower’s elevator! Department S were a new-wave band whose most famous hit was, Is Vic There? The follow up to this single was, I Want and the video featured several glimpses of the Trellick Tower. Much of the promo was filmed on the estate surrounding the high-rise; most notably next to the tracks which run alongside the estate, carrying trains in and out of Paddington; a vantage point which allows commuters a good view of the Trellick. Incidentally, my uncle was the bass player in this group! Although his bass-work can be heard in the soundtrack, he does not actually make an appearance in the video… by this point, he’d fallen out with the band over ‘creative differences’! This video features lots of spinney shots; driving around the estate and darting down the Trellick’s stairwells. An early video from the 90s Brit pop group, For Tomorrow was filmed all over London. Being such a famous landmark, it was only natural that the Trellick Tower got a look in. 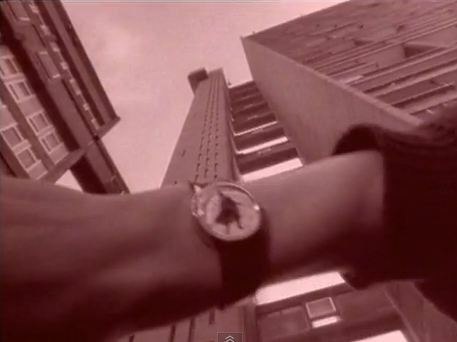 Another song from the Britpop era, this video is a fantastic showcase for the Trellick’s architecture- even the tower’s boxy, metal lifts are employed on the shoot… very cool indeed! Love this post! Wish I had read blogs and known about this one when we lived in London. Thank you so much 🙂 Hope you get to come back and see it one day. Great article which I enjoyed reading. I was engaged by your enthusiasm for the building. The world is a strange place, where eg the kidnapped can fall in love with their jailers, so I’m not criticising your views which are as valid as anyone’s. By the same token, I’m in the Fleming camp: this building and others of its ilk are IMHO crimes against humanity. I do not rejoice in ugliness and would happily see it demolished tomorrow. The idea that Goldfinger was paid to inflict this menacing eyesore on the world is a travesty, and that he thought it was good and beautiful surreal (in French ‘le comble’). His is the architecture of gas chambers: efficient, brutal machines – not for living (as Corbusier would have it) but for managing (sub-? )human ‘hordes’. As such it is a fitting monument to the human capacity for insensate totalitarianism. Wow, very interesting thoughts indeed… many thanks for sharing. Ian Fleming. Great novelist but was he an architectural critic? Sure, you might not like Trellick but there are plenty that do, and not just for aesthetic reasons but practical ones. Goldfinger belonged to a group of modernist architects who displayed attention to detail and used quality materials in their work. Decades before CAD software, he created a device to help measure the maximum amount of light in his buildings. He lived in Trellick’s sister building, Balfron Tower and took the views of its residents before building Trellick and moving his practice in there years later. The real villains of the peace are the councillors, shady contractors and shoddy workmanship that resulted in hastily built blocks like Ronan Point, which sullied the reputation of architects like Goldfinger. Housing policies that didn’t consider the diverse needs and socio-economic problems of residents. A lack of political will (from both red and blue governments) that ensured estates weren’t maintained, funded and working well. These are the real crimes against humanity. That Goldfinger’s buildings are still going strong says quite a bit. Why don’t you go online and find out about the residents who live in these ‘gas chambers’? Find out more about Lee Boland who talks passionately about living in Trellick. Or philosopher Nigel Warburton, who lived at Balfron for a while. He eventually wrote a book about the architect. I grew up on an estate, not far from Ronan Point. Yes, I know about Trellick’s reputation as the ‘tower of terror’. I also know how its tenants were given greater autonomy over their living conditions and now the building has sort-after apartments. High rise living may not be for everyone, but there are many who make it work. His listed towers are here to stay. We need to add more to the debate than just ‘mock-Tudor = good’ and ‘concrete = bad’. Many thanks for the detailed comment. I personally adore the Trellick tower, especially the view at night when hurtling past on the Westway; one of London’s greatest sights. I also have relatives who live in Glenkerry House; it’s a wonderful residence and lovingly cared for by the residents. great article which I much enjoyed. wonderful research in Trellick in film and video. Thanks, Tanya that’s very kind of you. I understand the leaseholders will have a huge section 20 repairs liability . though if they were tenants who bought early they must be laughing. Hi, thank you! Thank you! Thank you! 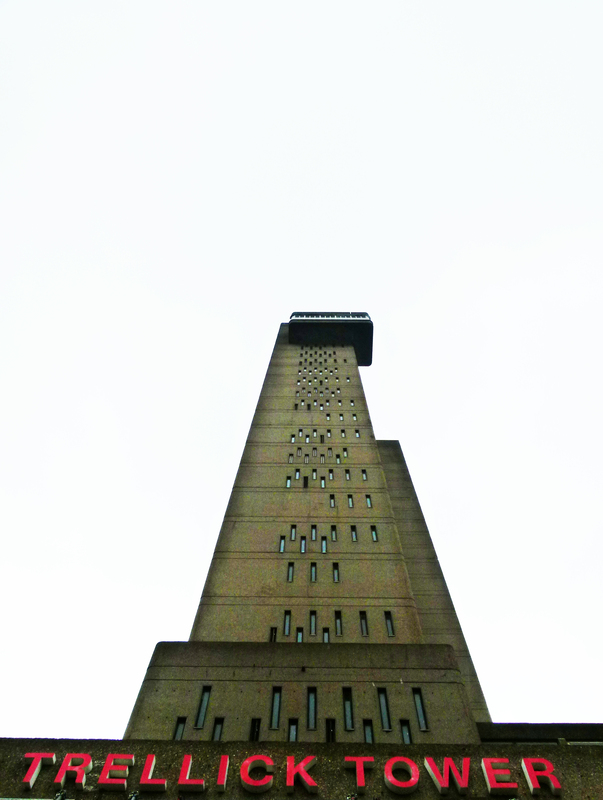 Thank you for this post about The Trellick Tower! I have been infatuated with this wonderful piece of architecture for some time and I was pleased to read your article. Also the links to the videos in which it has been depicted were great. Good job! I don’t know whether the building is normally inaccesible for non-residents but my brother who lives in London went to take some pictures there because I asked him to and he got into the building, went to the top and back down again, taking random pics of the inside of the building for me. I’d be happy to send you a pic if you like. Hi Fabio, many thanks for the kind message… I’d be very happy to see a pic 🙂 ! Hi, View from the Mirror. Where can I send you a couple of pics of the inside of the Trellick Twr.? Hi Fabio, my details can be found on the contacts page. Kevin Mcloud did a whole program on the Trellick, he even climbed it! What a fascinating and insightful post about the father of modern Brutalism in London and his legacy! Thank you! The equivalent to Trellick Tower in the North East was Derwent Tower in Gateshead, AKA The Dunston Rocket, whose design was inspired by an Appollo Moon rocket. At 200 feet tall this was on e of the tallest buildings in the North East and could be seen for miles around. Unfortunately there was no happy ending for Derwent Tower. Lift failures, low water pressure, damp on the highest floors and a reputation for crime and anti social behaviour saw the block of flats become a place only the homeless wanted to live in and it was demolished in 2012. In one way I was glad as it was a hellish place to live, but on the other hand it was a shame to see such a landmark go. I can remember the first time I saw the Trellick Tower was 30 years ago when I decided to see what the BBC Television Centre looked like for real( another building that is currently undergoing a new lease of life) and noticed Trellick to the east. I’d seen tower blocks in Manchester and Newcastle, but this was like something else, it dwarfed everything around it. Also the character in Tuckers Luck was Tucker’s mate Tommy, who decided to join the navy in the last series.